Dehai News -- TheDiplomat.com: What Will the US-China Trade War Mean for Africa? TheDiplomat.com: What Will the US-China Trade War Mean for Africa? 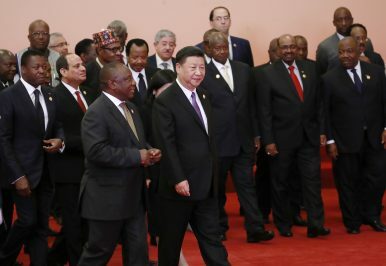 Chinese President Xi Jinping, front center, South African President Cyril Ramaphosa, front left, and other African leaders walk together after a group photo session during the Forum on China-Africa Cooperation (FOCAC) 2018 Summit in Beijing (Sept. 3, 2018).